Learning with Nature is full of fun activities from the Forest School. The games will get your children outdoors to explore, have fun, make things and learn about nature and help them grow up happy and healthy. Suitable for groups of children aged between 3 and 16, the graded activities help children develop:Key practical and social skillsAwareness of their place in the worldRespect for the natural worldall while enjoying the great outdoors. 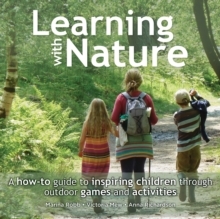 Written by experienced Forest School practitioners, using tried and tested games and activities, it provides comprehensive information for enriching childrens' learning through nature. The games and activities are clearly categorized, with step-by-step instructions, age guide, a list of resources needed, and invisible learning points. This book is a unique must-have resource for families, schools, youth groups and anyone working with children.